Switch on your shop mode! 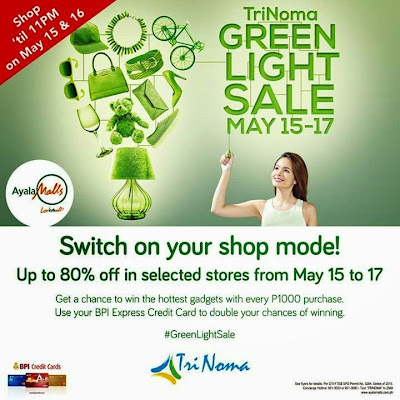 TriNoma Green Light Sale from May 15 to 17, 2015. Up to 80% OFF in selected stores. Get double chances of winning iPhone 6, Macbook Air, Ipad Mini 3 or Go Pro Hero 4 for a minimum single-receipt purchase of P1,000 using any BPI Credit Card. TRIPLE your chances of winning with your BPI Amore Visa. 1. The promo is open to all customers of TriNoma. 3. Receipts from any TriNoma store are accepted excluding services, bills payment (Globe, Sun, and other utilities companies) and Landmark Department Store and Supermarket. 2. Present the qualified receipts to claim the raffle coupon/s at the redemption booth located at the main concierge booth at Level 1 from 10:00am to 9:00pm on May 15-17, 2015. 3. Customer must completely fill-up the raffle coupon with the following details and drop at the designated drop box located at the Redemption Booth. Raffle stubs with incomplete details are deemed invalid. 4. Deadline for submission of raffle entries is at 10:00 PM of May 17. The drop box will be sealed at 10:00 PM by the authorized representative from TriNoma administration office for safekeeping. 5. Raffle draw will be held on May 18, 6pm at the TriNoma Administration Office in the presence of a DTI representative. 7. Winners will be notified via registered mail, email and telephone call. A customer can only win once. If a customer wins more than once, he will get the prize with the higher value. Winners must claim their prize from 10:00 AM to 5:00 PM, Monday to Friday, at the TriNoma Administration Office located at TriNoma, level 4. 8. Unclaimed prizes after sixty (60) days from receipt of written notification will be forfeited in favor of TriNoma with prior approval from DTI. 9. Prizes are transferable but not convertible to cash. 10. The owners, management and employees of Ayala Malls, their advertising agencies, spouses and relatives up to the 2nd degree of consanguinity or affinity are disqualified from joining the raffle promo. 11. All decisions made by Ayala Malls, with the concurrence of DTI, will be deemed final and irrevocable.